Metallosis after Hip Replacement is a known phenomenon but metallosis after knee replacement is quite rare. Epidemiologist with the U.S. Food and Drug Administration, College Park, Maryland, USA. Department of Pathology, Suburban Hospital, 8600 Old Georgetown Rd, Bethesda, Maryland 20814 USA. Pediatrician, Private Practice, Olney, Maryland, USA. Introduction: Metallosis involving the knee joint most often results from metal-on-metal contact late in the life of a failing implant following polyethylene wear. We report a case of acute metallosis following knee arthroplasty in a previously healthy 59-year old male. 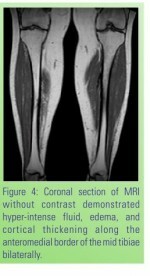 Case Report: In June 2011, the patient underwent left knee arthroplasty for severe osteoarthritis with necrosis and bone edema in the medial femoral condyle and tibial plateau. Nine months later, because of persistent pain and swelling in the joint, revision arthroplasty was undertaken along with partial synovectomy. Examination revealed pristine prosthetic implants in the absence of loose fragments of bone or glue. 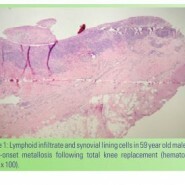 Synovial pathology exhibited marked chronic inflammation and hyperplasia with extensive finely granular foreign material resembling metallic debris. Laboratory analysis of synovium revealed a predominance of iron, the principal component of the saw blades. Conclusion: We hypothesize the patient experienced acute metallosis resulting from deposition of metallic fragments from three saw blades used during arthroplasty. We believe the increased density of the patient’s bone that required use of multiple blades may have resulted, in part, from heavy lifting the patient partook in during the two years preceding arthroplasty. Keywords: Metallosis; knee arthroplasty; saw blades.